The timing of Pompeo's trip has generated much speculation about whether he is throwing the Trump administration's support behind Netanyahu as he is locked in the race of his political career, an election being followed closely across the Middle East as it could reshape the Jewish state's government at a critical juncture in the United States's regional fight to thwart Iran and its terrorist proxies. Pompeo, State Department officials said, has no plan to wade into Israel's election, with sources saying his talks with Netanyahu and other senior Israeli diplomats will focus on the destabilizing role Hezbollah plays in Lebanon, another country Pompeo is slated to visit while in the region. 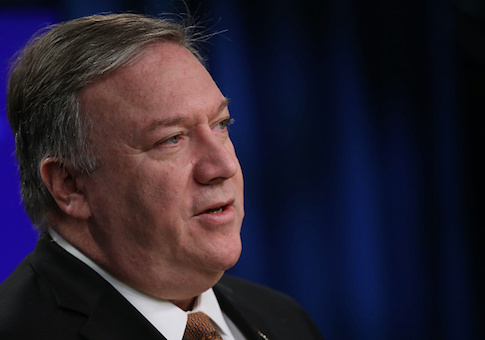 With the Israeli elections heating up, Israel has experienced a rash of terrorist attacks in recent days, making Pompeo's appearance in the Jewish state all the more remarkable. Sources expect the secretary of state to affirm Israel's right to self defense and, in private meetings, discuss aiding the Israeli military's efforts to combat Hezbollah, which still asserts control in Lebanon. However, Pompeo is facing a tricky diplomatic hurdle during his trip: How to convince concerned Israeli leaders the United States is combatting Hezbollah at the same time is provides the Lebanese Armed Forces with weaponry (LAF), some of which has made its way to Hezbollah militants embedded in that fighting force. "The secretary will meet with a range of senior Israeli officials," a senior State Department official, speaking only on background, told reporters. "We'll be talking about regional issues, obviously, discussing the challenges posed to the region, to Israel, to the United States by Iran and by Iranian proxies. The secretary will reaffirm both privately and publicly during that visit our unwavering commitment to Israel's security and its right to self-defense." Asked why Pompeo has chosen to arrive in Israel while the country's elections are unfolding, the State Department emphasized that U.S.-Israeli cooperation on various military situations cannot stop. "Obviously, in those discussions the secretary will be discussing quite directly the challenges posed by Iran, its illicit activities, its threatening behaviors, Lebanese Hizballah, their illicit activities and threatening behaviors, and how this all plays for a promising future—or against—for the people of Lebanon," the senior State Department official said. The State Department still will not admit that its arms program with the LAF has benefitted Hezbollah, saying only that Lebanon's security institutions must be bolstered by the United States. "We strongly support … the continued U.S. engagement with Lebanese security forces, most notably but not exclusively the Lebanese Armed Forces," the State Department official said. "They are the legitimate security institution or institutions of Lebanon. Our support for them, the work that they do, their ability to be seen by the people of Lebanon as the legitimate defenders of the state stand in stark contrast to the illegitimate security presence structures of Lebanese Hezbollah and the Iranian Revolutionary Guard Corps presence in Lebanon." Pompeo will meet with Netanyahu during his trip, the State Department confirmed. He will not, however, meet with any candidates running for his office. "We have critical, important bilateral, regional, and transregional issues to discuss with the Government of Israel," the State Department official said. "That is the context for all of his meetings. He will not be meeting with candidates because the meeting with the prime minister is in his capacity as the prime minister of Israel." The bulk of these discussions will focus on Iran's use of Hezbollah to further its regional ambitions. "There'll be no stepping around the issue of Hezbollah's presence in the Lebanese parliament, in the Lebanese cabinet," the State Department official said. "That, in fact, is an issue which the secretary will be addressing quite squarely in his meetings." "The challenge here, the issue here for us is not that fact; it is what does Hezbollah do with that presence? What is the impact, the influence of Hezbollah, of Iran through Hezbollah, on the future of Lebanon, on the fate, the hopes of the Lebanese people?" the official said. "No, the secretary will not be meeting with Hezbollah. That is not U.S. policy, not in Lebanon, not anywhere else in the world. But there is going to be no skating around the challenges posed to Lebanon and its people by Hezbollah." This entry was posted in National Security and tagged Benjamin Netanyahu, Israel, Mike Pompeo. Bookmark the permalink.